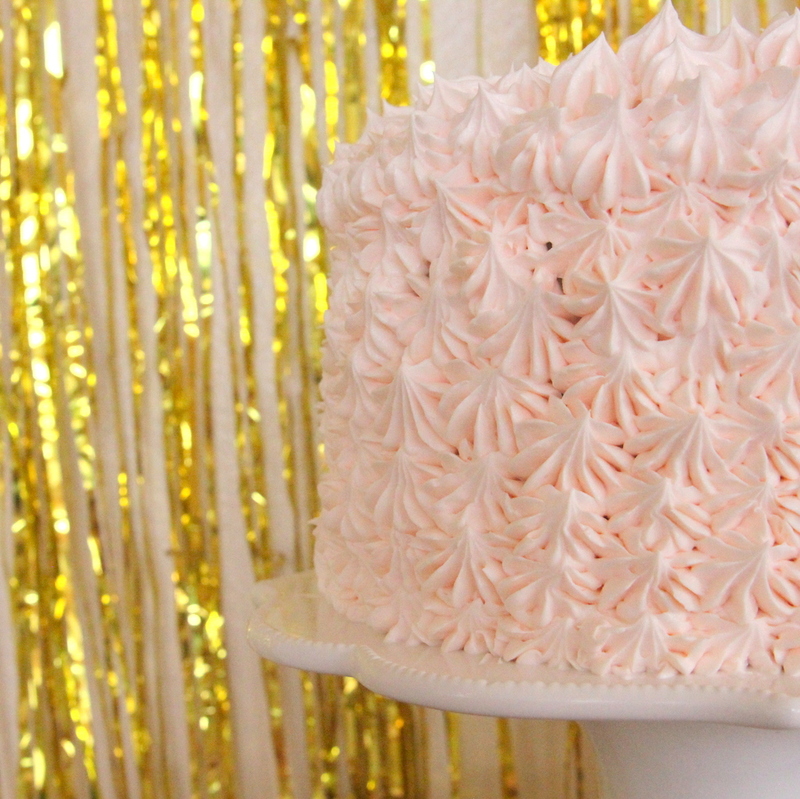 My kids start planning their birthday parties months in advance (ok, a year in advance). Probably because their mom totally encourages this practice, just a theory. 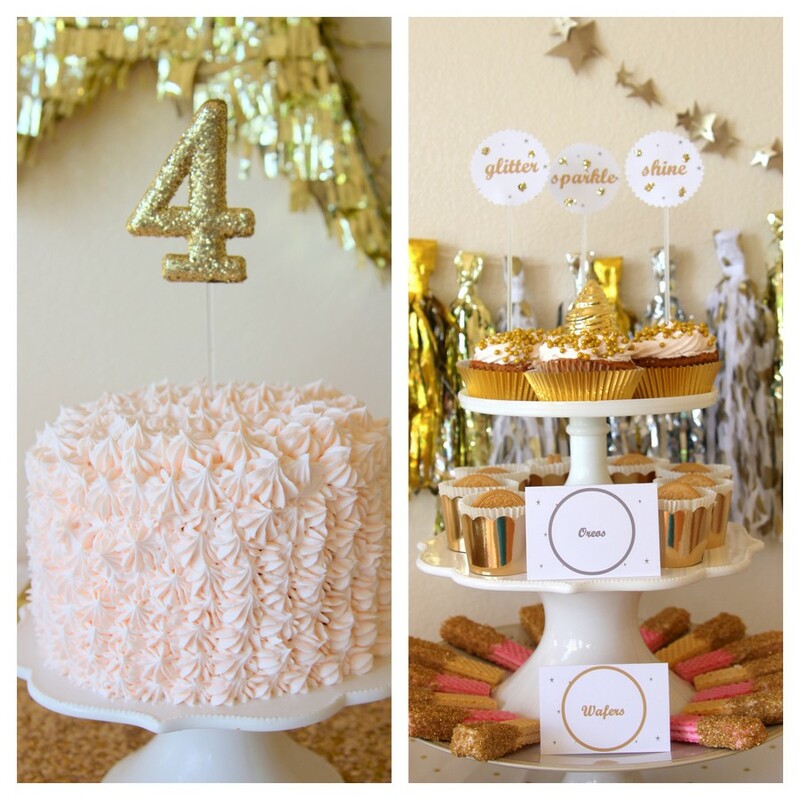 Anyhow, shortly after Piper’s Madeline birthday party, she declared ‘sprinkles’ to be her next theme and would not be dissuaded by my reminders of how much she loves trying new things (and the fact that she’s already had a sprinkle party). 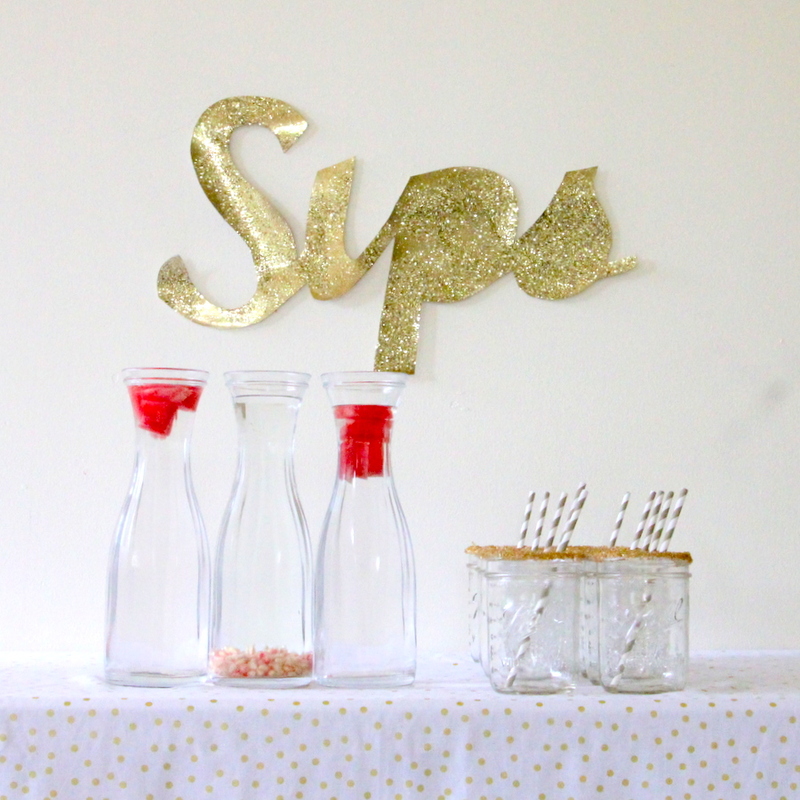 That is, until I mentioned a sparkle party. 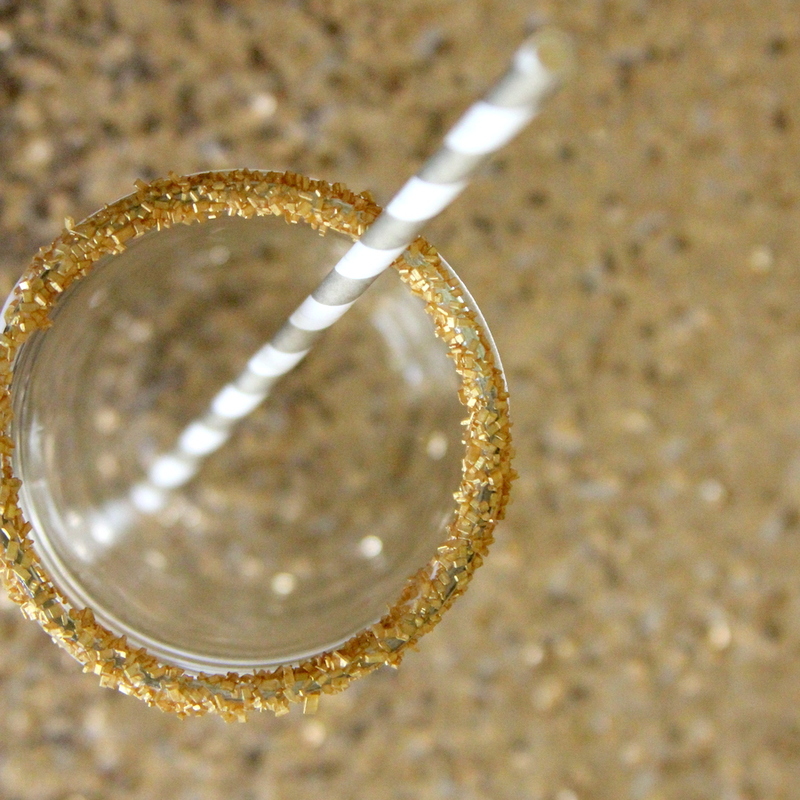 My glitter girl cannot resist sparkles, glitters, or shimmers and spent the next many months gathering gold inspiration for me (mostly in the form of sparkly toys and dresses). 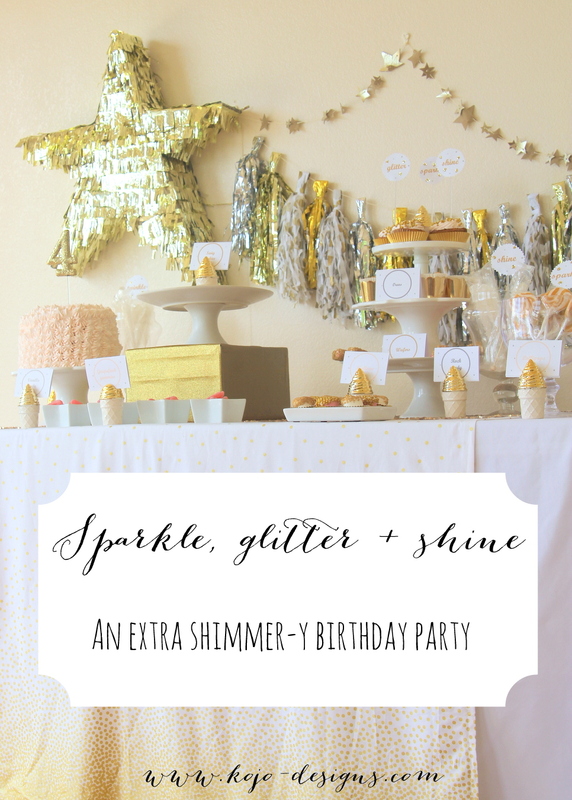 Turns out, a sparkle party for The Glitter Girl is a recipe for a really great birthday party. 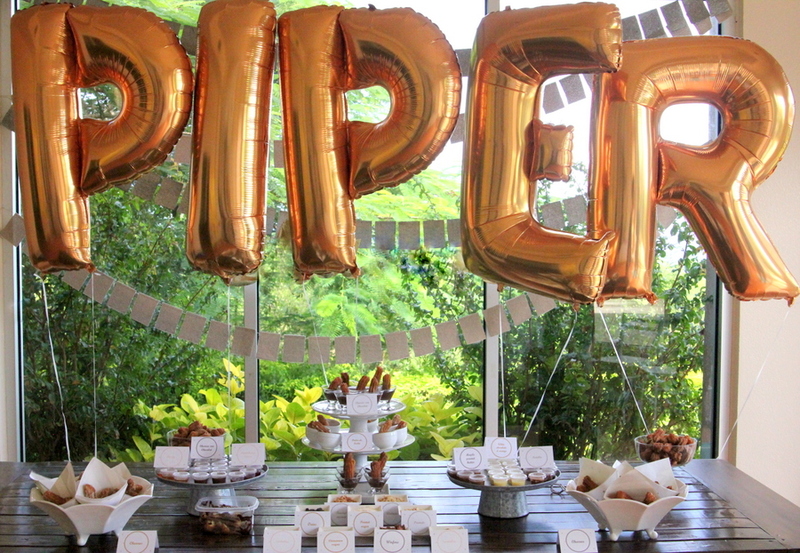 The Churro Bar was the main event, food wise (more details to come on that), but what’s a Piper party without a whole table full of sugar? 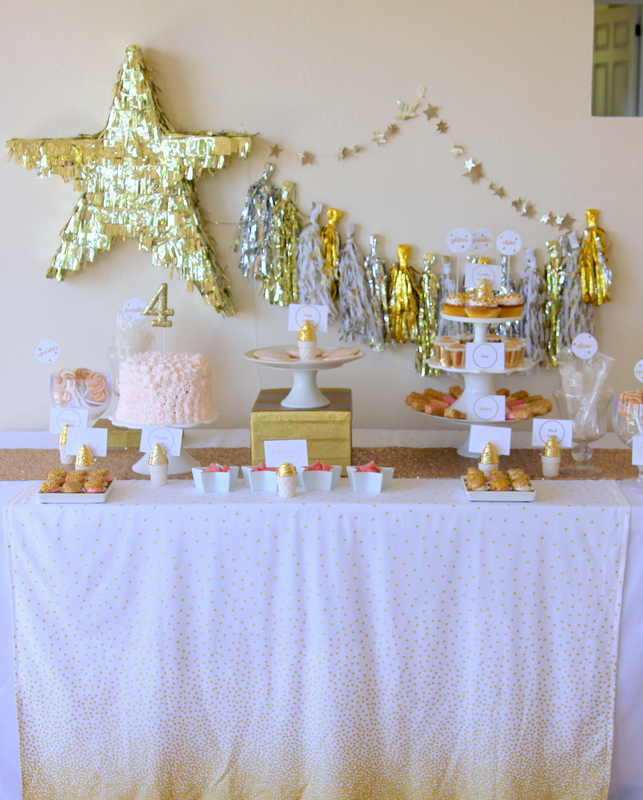 That girl’s love language is dessert, so I always focus most of my efforts on the treat table. 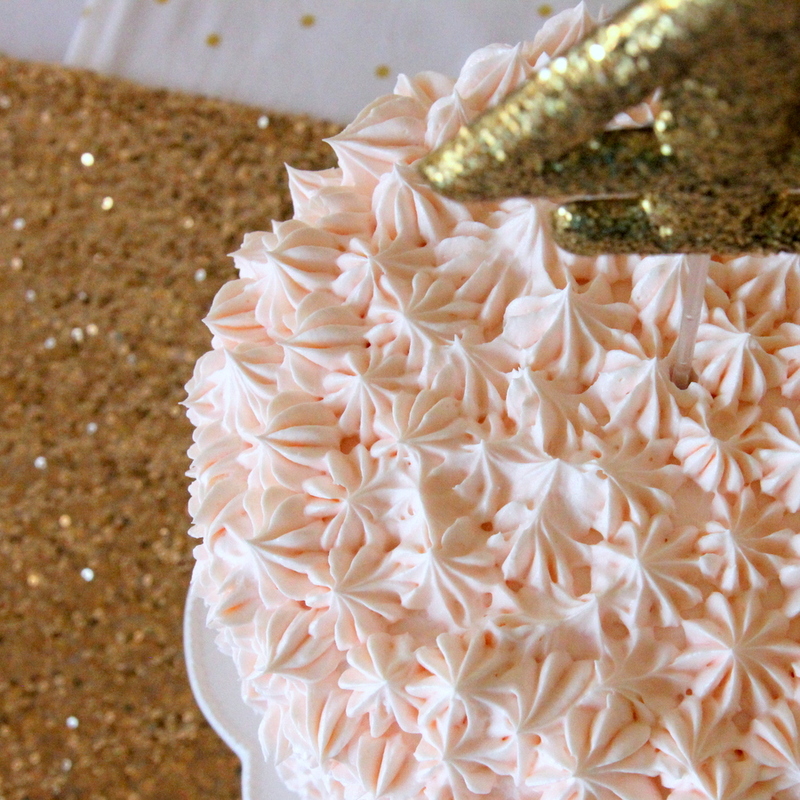 I made this cake (recipe by sweetapolita– it was a giant hit!) 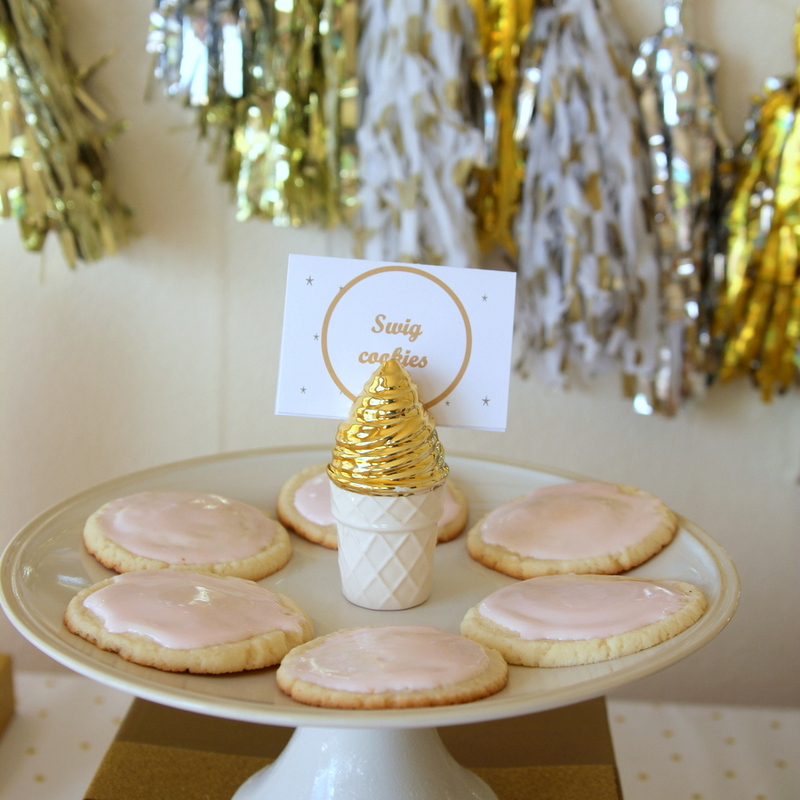 and knock-off Swig cookies (in love with these gems as well). 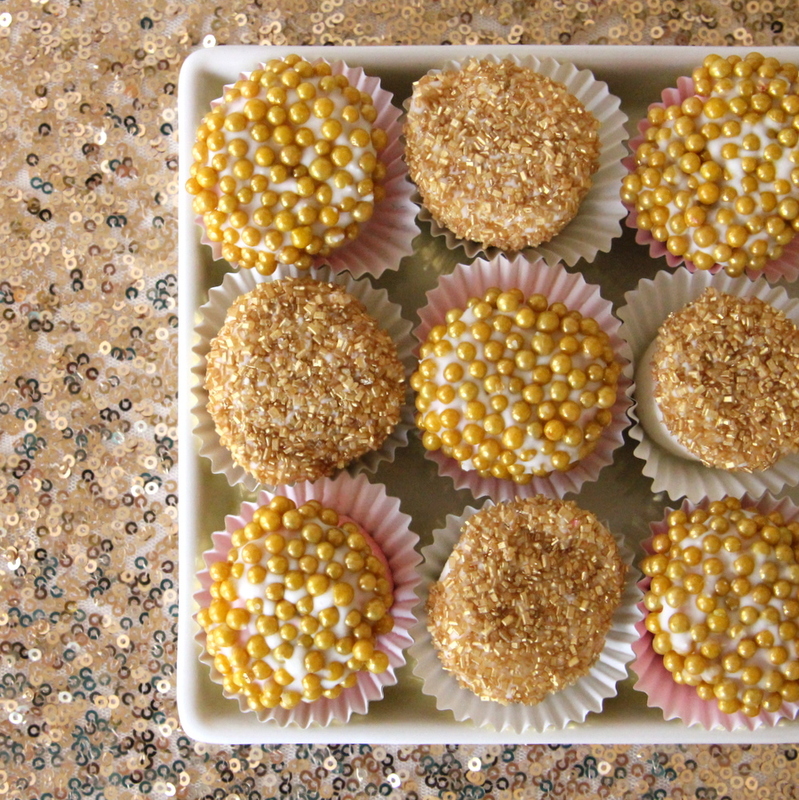 Grapefruit gummies, golden birthday cake Oreos (sent from Denver- thanks to my mama! 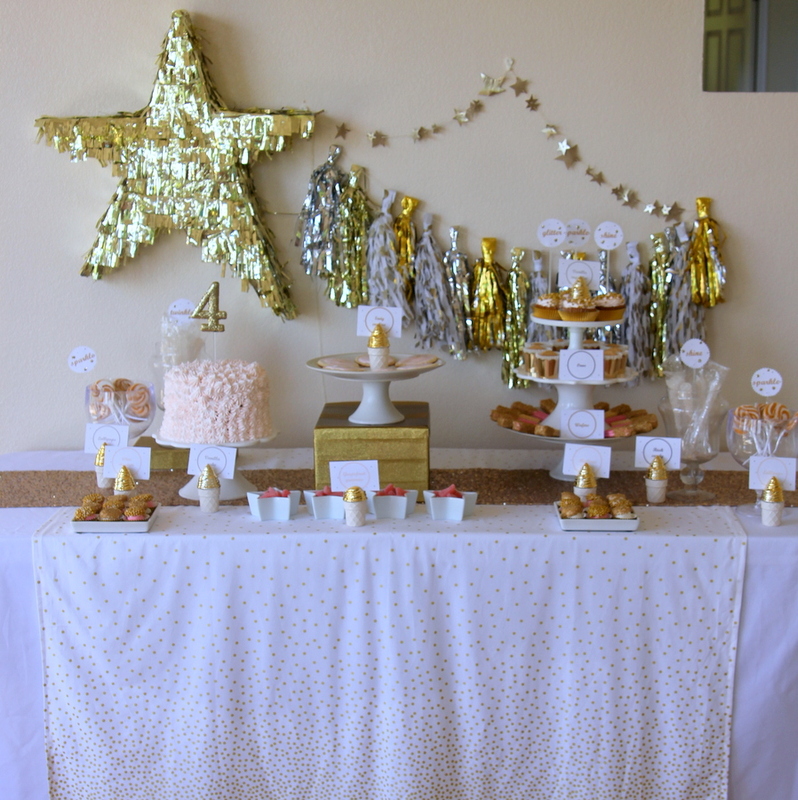 ), chocolate dipped/gold sprinkled marshmallows and wafers, white rock candy and gold swirled lollipops rounded out the treat table. 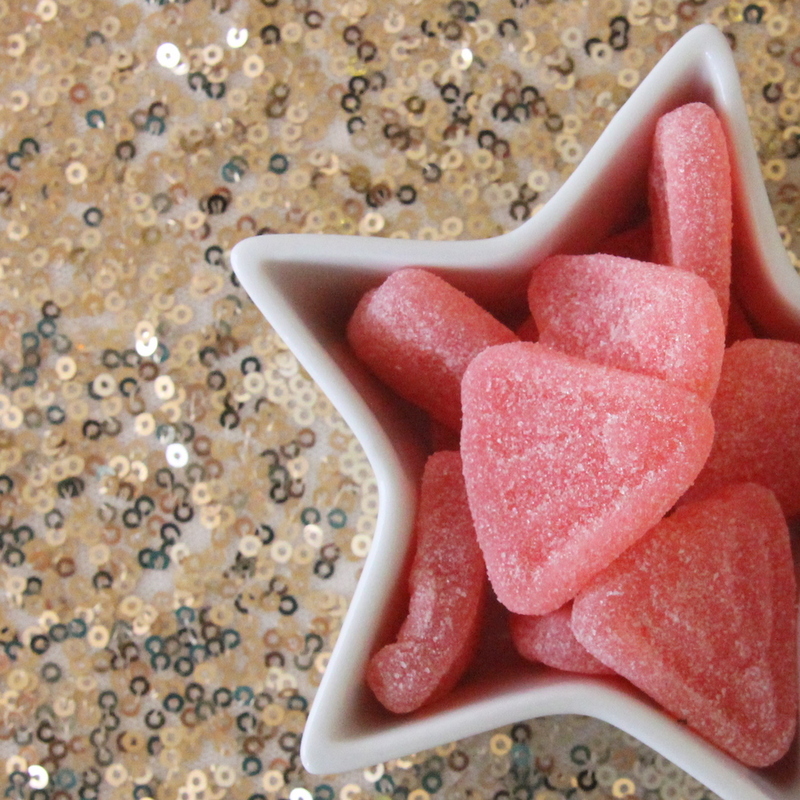 The “Sips” table included pink lemonade and flavored waters with floating watermelon and pomegranate. 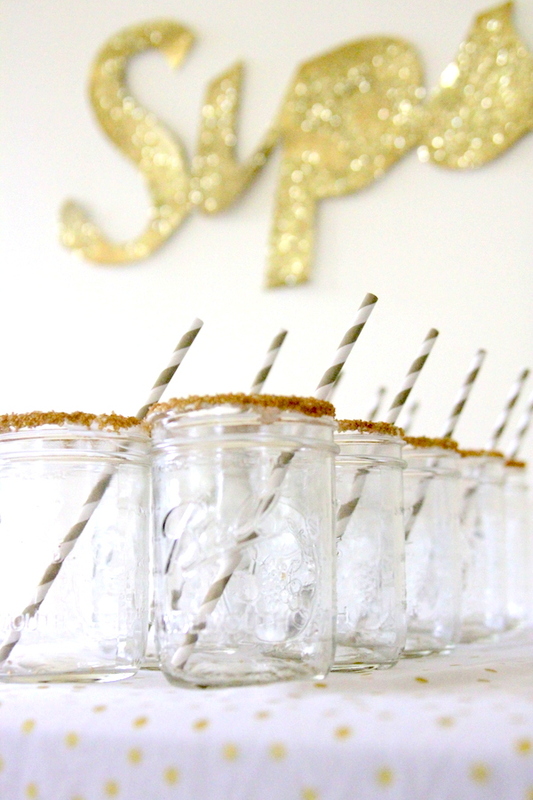 Gold sprinkle rimmed mason jars with gold stripey straws added a little extra shimmer. 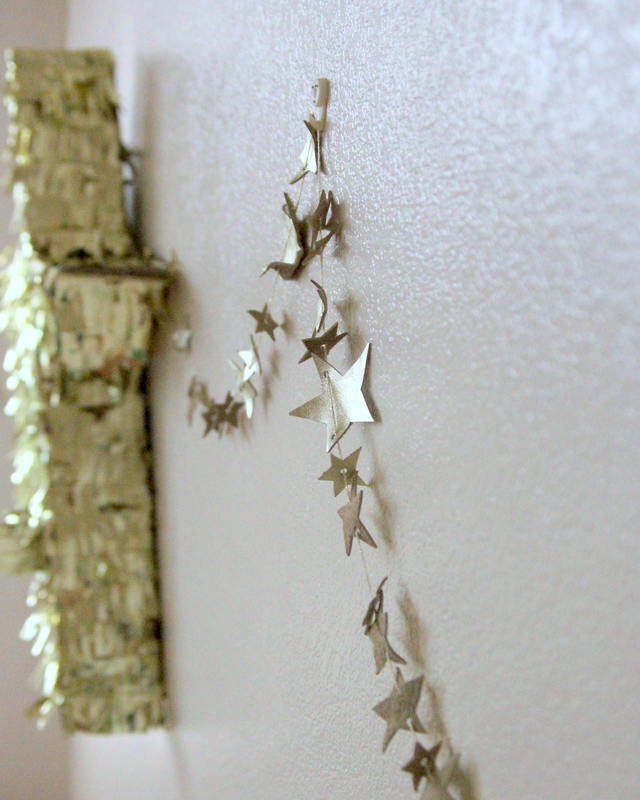 …metallic tassels all in a row. 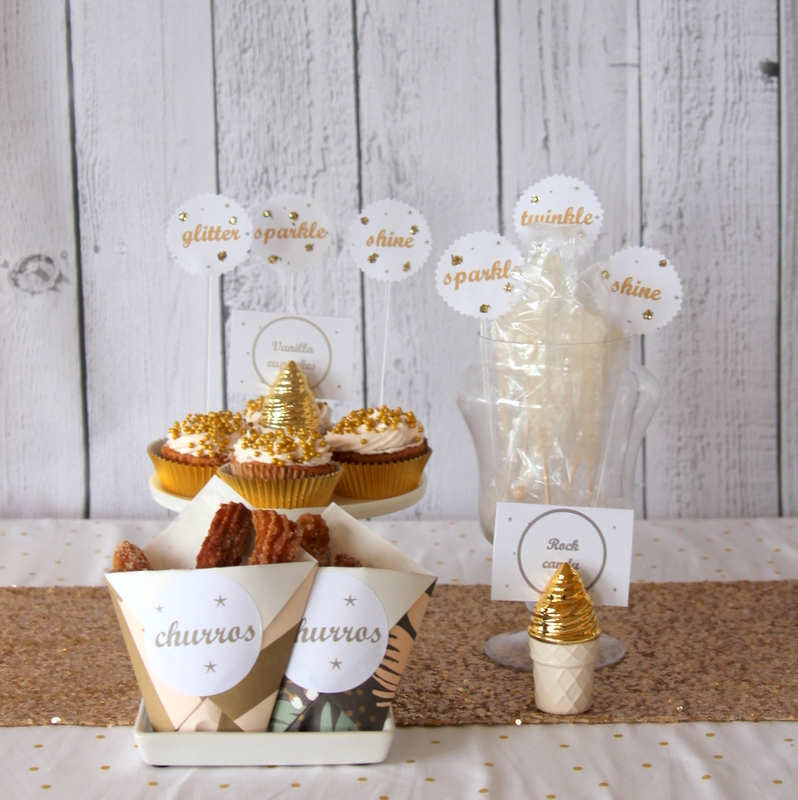 There are just too many fun, sparkle-y things to put in a glitter party favor bag. Of course, I had a hard time narrowing. 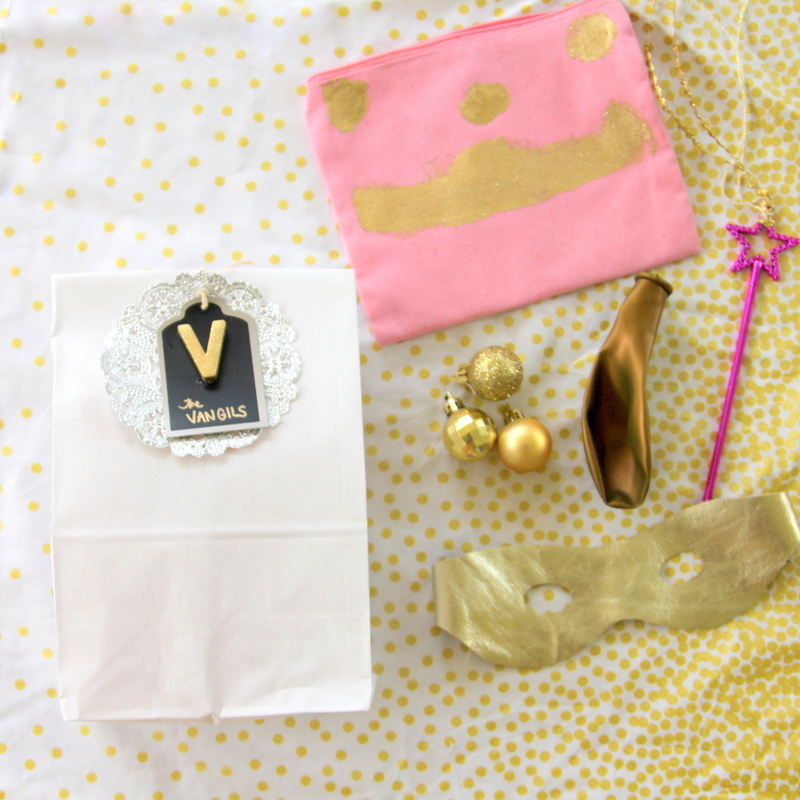 Each favor bag was filled with a gold leather super hero mask, a few glitter-y Christmas ornaments, a gold balloon, and a pink and gold fairy wand and plain linen cosmetic bags that Piper and I painted with gold and glittered fabric paint. 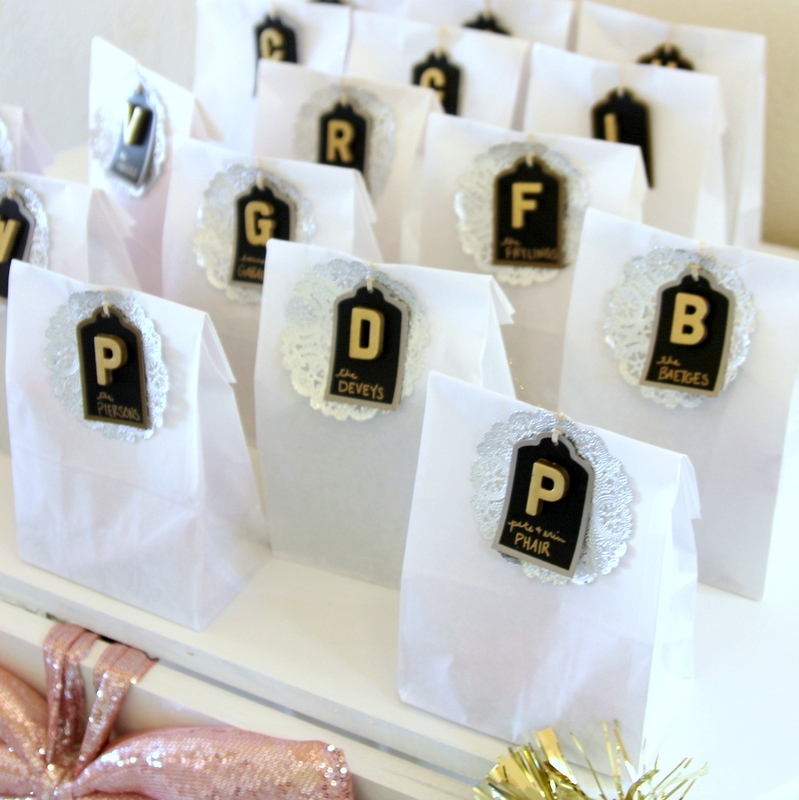 The tags- one of my favorite parts of these favors by the way- are just tags from Target’s dollar bin with an alphabet magnet (painted like this) hot glued in the center. 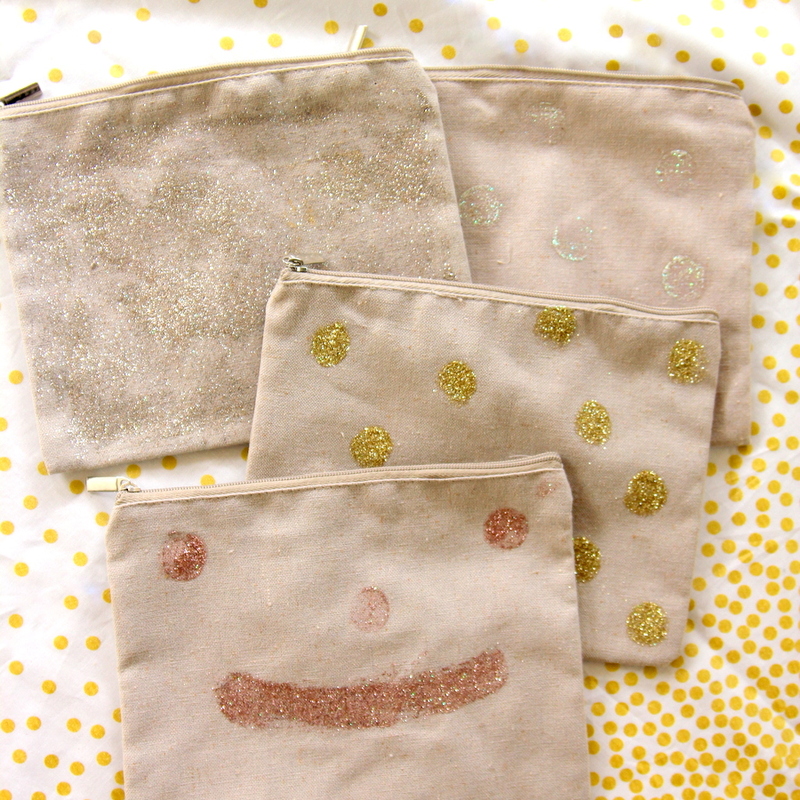 Sidenote about the painted makeup bags- Piper and I had such a fun afternoon decorating the bags. 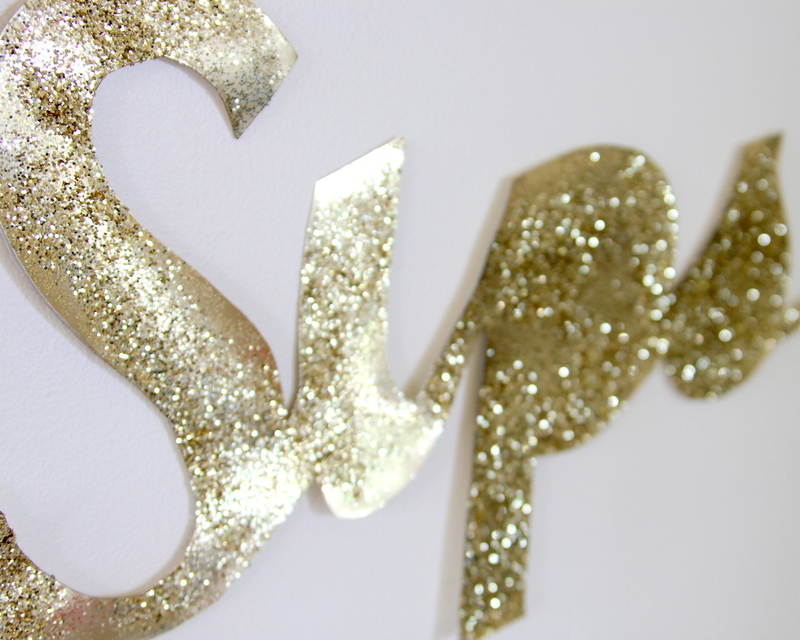 We stamped and dotted and painted- the faces that she made were my very favorites. 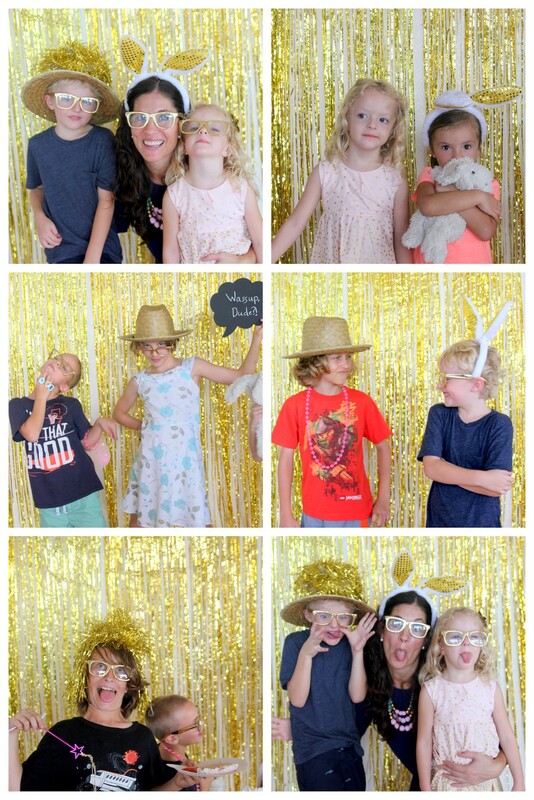 I wish I had more pictures of the guests and their photobooth shenanigans. 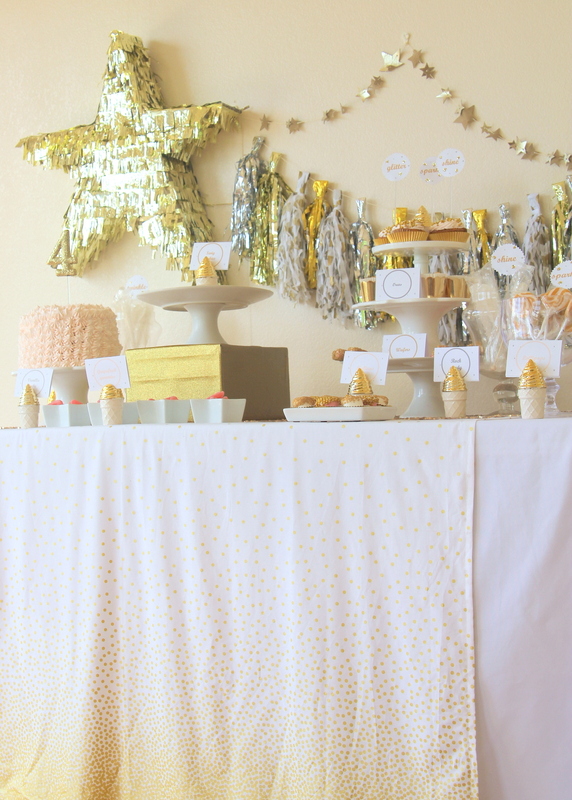 Most of the kids wore gold props throughout the party- love that! 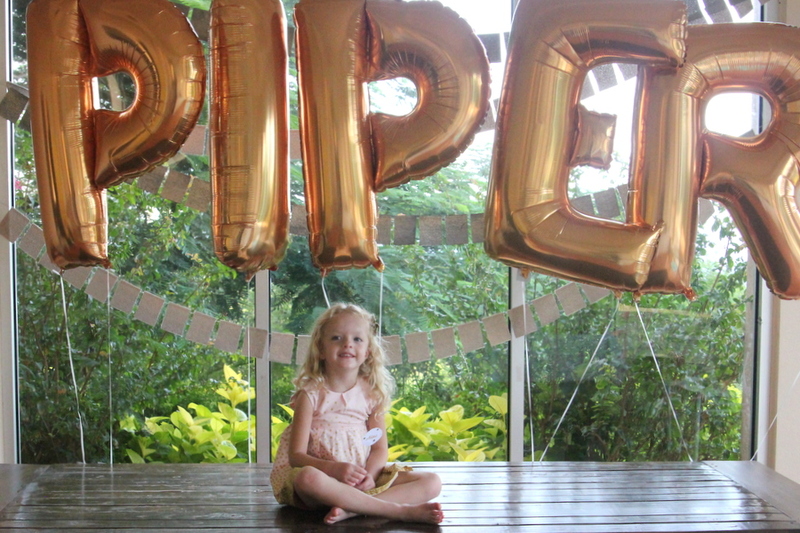 And we completely forgot to break open the piñata- funny, right? 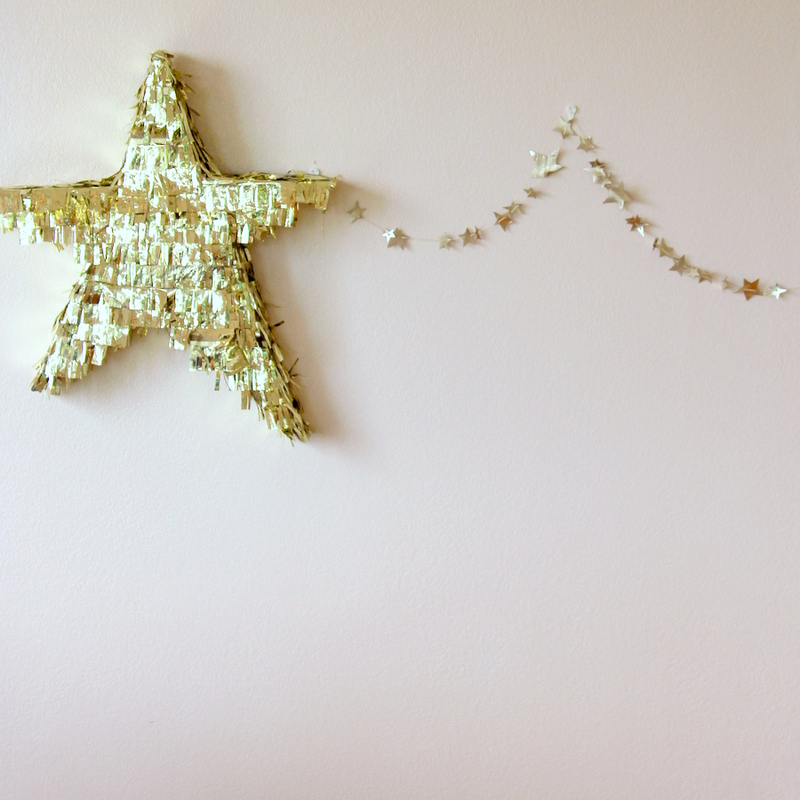 The good news is that I acquired a decoration for Burke and Piper’s reading nook in their room (accompanied by these leather garlands). 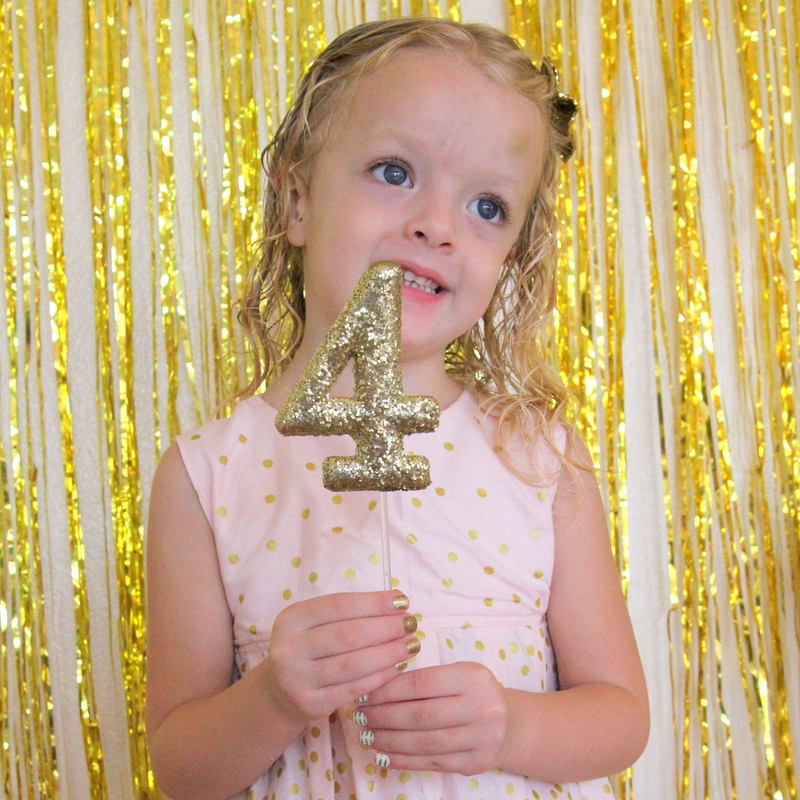 Between the sparkles everywhere and the proliferation of sugar, it was a truly great sparkle party for our glitter girl! 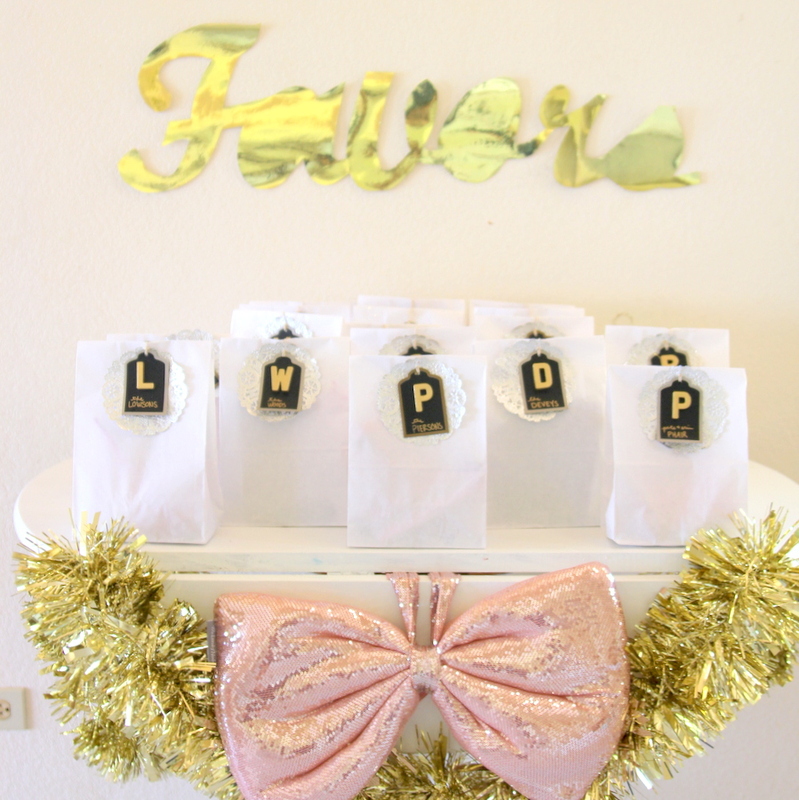 Where did u get the makeup bags for your glitter party? 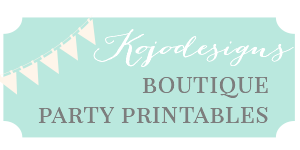 Having trouble finding plain ones? Hey Michelle, I found them in the target dollar bin (many moons ago). I feel like it’d be so great if Target did those again- they were awesome.